These days 'time-stretching' almost seems like a slightly outdated term. What was once a fiddly and elaborate process requiring specialised gear, is now handled quickly and easily right inside most DAWs, via warp markers and simple tempo adjustments. Yet the process occupies something of a dual existence these days. On the one hand, with high quality software, it's possible to achieve near-pristine adjustments of almost any kind of source material. On the other hand, the odd sounds and effects of those 'old school' methods are still hugely prevalent throughout modern music - from re-pitched Hip-Hop vocals to the iconic retimed breaks of Drum 'n' Bass. Whatever your stretching needs, we've got it covered, with a whole host of tutorials, a comprehensive gear guide and insight from the artists and developers behind those iconic sounds. 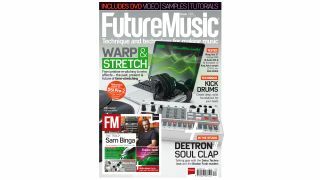 Regular readers will notice we've made a few changes to FM this issue, adding a batch of new features and expanded tutorials. Grab the issue now to check out our new video-led artist feature, The Track, and the first edition of FM's new monthly modular synthesis column. As ever we've a whole host of videos, audio examples, tutorial files and samples waiting for you too. Piezo Fun - Contact-mic crazy FX aplenty. Get experimental!